Michael McFadyen's Scuba Diving - Barrens Hut Back in the early 1990s when I first wrote this article, if you were to do a poll of a hundred regular and experienced divers in Sydney and asked them the name of the best boat dive site in the Sydney area, I am certain that the a majority would reply "Barrens Hut". Barrens Hut has everything you want in a dive site and really deserves its excellent reputation. It is, in my view, one of the top five reef dive sites in NSW (note that as there is now no dive boat operating on a permanent basis out of Port Hacking, this site is no longer dived much). Located only a few hundred metres off Royal National Park on the southern outskirts of the city, Barrens Hut is named after a squatter's hut built a long time ago into the side of the rocky cliff. The dive site itself is one of the most spectacular I have ever seen, with the main part of the dive formed by a dramatic drop-off from the reef top. The reef extends from the rock platform out to the site, with the top at a depth of 12 to 16 metres. The top of the reef is, to put it bluntly, boring, being covered with kelp and sea urchins. However, come to the edge of the reef and everything changes. 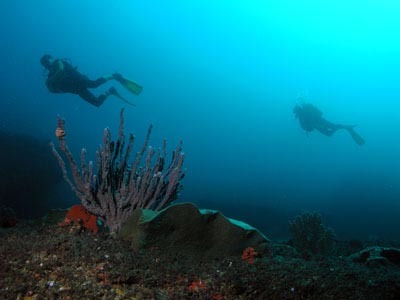 In the space of a few metres, the reef drops off to a sandy bottom with a maximum depth of 28 metres. The walls formed by the drop-off are completely covered with plant and animal life of many species. All this life attracts a huge abundance of fishlife, including its famous friendly blue gropers and different species of wrasse. 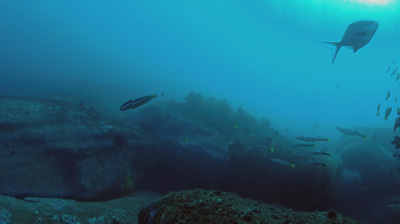 Far enough from the main population areas of Sydney, Barrens Hut is usually blessed with relatively clear water, with an average visibility of about 15 metres. On a number of occasions I have had visibility of over 30 metres. For example, during the last two weekends of January 1996, visibility was in the order of 21 metres and the fishlife absolutely unbelievable and in mid-July 1998, I had 30 metres visibility. In May 2010 we had 25 metres and July 2014 we had 30 metres. But first, a description and tour of the site itself. After leaving Port Hacking in your boat, turn right and travel the two kilometres or so until you are immediately opposite the southern end of the township of Bundeena. GPS marks of 34° 05' 29"S 151° 10' 23"E will put you in the vicinity of the dive site (note that most of my GPS Readings are using AUS66 - if you use any other datum, you will need to convert the reading - see my GPS Page for more details). Starting about three hundred metres off-shore, you should line up the distinctive Cape Cod style house at Bundeena that you should be able to see with the middle vertical mark to the immediate north of the rockfall on the cliff and run in towards the shore. This is as per above right. The house will disappear and using the depth sounder, anchor when the bottom rises rapidly from 28 to 16 metres or shallower. This should put you on the reef near the edge in the vicinity of the northern end of the dive site. If you want to be over the cave and tunnel as per the dive site map, run in on the vertical crack to the left. The flat nature of the reef means that you may have problems getting your anchor to take hold. You should also look at the page on Link as normally we dive both parts of the site when we dive here. While descending you will see one of the reasons why Barrens Hut is so famous. FISH! Literally millions of them. Blue gropers (more about them later), huge schools of yellowtail swimming around the anchor line, enormous yellowtail kingfish coming in to examine you and one-spot pullers and ladder-finned pomfrets over the reef edge. 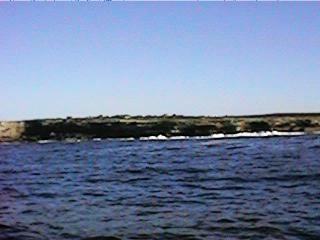 To the immediate east of the anchor should be the rocky area between The Split and the Barrens Hut dive site. 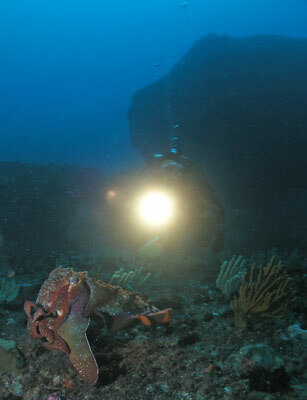 This consists of large boulders which provide a lot of small nooks and crannies in which eastern blue devils and cuttlefish can be found. Swim to the east till you hit the sand. In this area, look for purple ascidians which are home to the very rare donut (rose-ringed) nembrotha (Nembrotha rosannulata). 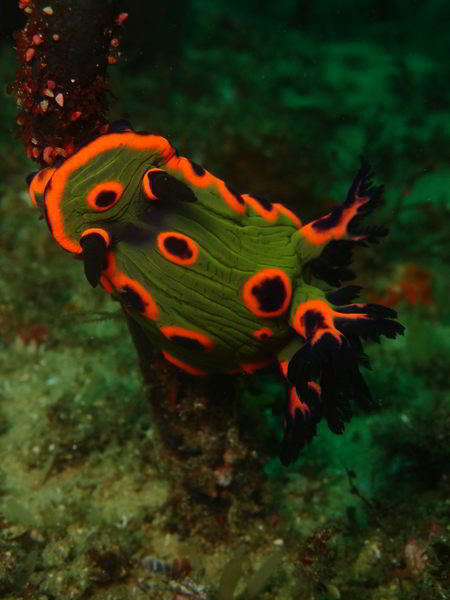 In May 2010 I found a donut nembrotha in the area in front of The Cave, but we now normally see them in this area. These are normally only found on the western side of Cabbage Tree Island at Port Stephens. 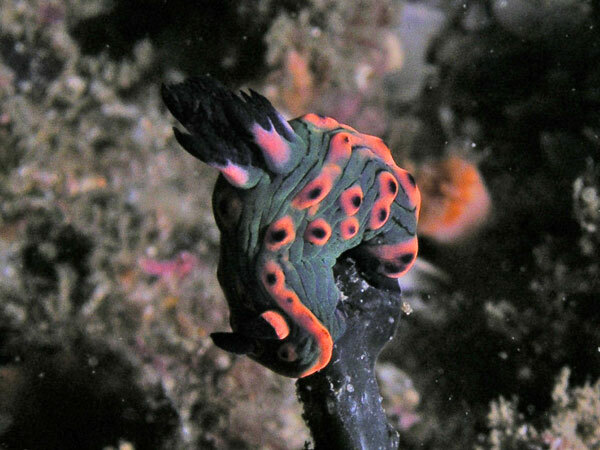 They have been seen elsewhere, but only rarely (we are now also see most dives at Pizza Reef). Brilliant! Turn south and follow it for about 20 metres till you reach "The Cave". This is quite large, although the back of the cave is fairly shallow. You can swim through from either side. From here there is a low wall for 10 metres and then a sheer wall runs to the south for approximately 40 metres. About 20 metres south of The Cave is "The Tunnel". Just before The Tunnel there is a small ledge and overhang. In here Kelly found some upsidedown pipefish in early 2014 and they were still there in July 2014. Enter The Tunnel which goes from the sand back under the reef and then climbs to the right in a chimney up to about the 19 metre level and exits back south-west of The Cave. Before entering The Tunnel, if you have air and time, swim over the small boulders on the sand in front of the entrance. The boulders are about 10 metres off the wall at a depth of 27 or 28 metres and support a variety of sponges, ascidians, sea fans, soft corals and nudibranches. 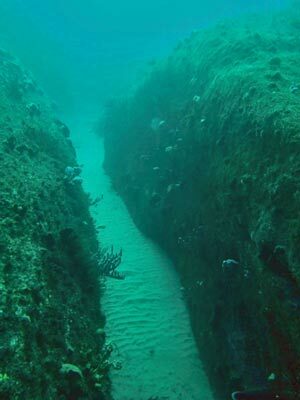 A lot of small fish live here, including pygmy leatherjacket, snakeskin wrasse, old wife and Gunthers butterflyfish. In July to September you may also see Port Jackson sharks in this area. In August 2001 there were vertebrae bones from a whale (not sure what sort) in front of The Tunnel. There were four but the next day there were only two. They were new as the cartlidge was still between the vertebrae. If it is really clear, swim out further into the sand "amphitheatre". 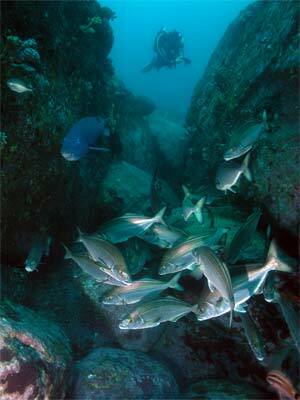 Here there are old wife, bream, snapper, moasic leatherjacket and numerous other fish. After returning to the wall, it is well worth examining the wall itself, especially that part to the left of the tunnel. Here you will find giant jelly ascidians (orange and white), Baird's solitary coral, Gabo Island soft coral, southern and Zimmets sea fans and sometimes wandering anemones. These are located immediately above and to the left of the tunnel entrance. There are sometimes eastern blue devilfish resident in the low caves under the wall. After entering the tunnel, check to see if there is a wobbegong blocking the middle part of the tunnel. It is very dark in there so you will definitely need a torch to explore. The tunnel is a lot deeper now than it was in the late 1980s as the sand on the right hand side has been washed out by a large storm about Christmas 1990. However, at the front the sand has built up from July 2001 huge seas. At the back of the tunnel, just before the chimney, there used to be an anchor that was partially buried in the sand. It seems to have disappeared and is perhaps now buried. The normal exit is by ascending vertically for a short distance before going up at a 45 degree angle to your right. This will bring you back out on the top of the large boulders. An alternative to this exit, if you are relatively small, is to turn right at the anchor and swim into the narrow slit for about 5 metres and then ascend vertically. This will bring you to the same spot. If you still have bottom time or air remaining, return to the sand and follow the wall to the north. You will pass the cave and swim over a number of low rocks. The wall and the rocks support more interesting life and stingarees and dusky flatheads are found on the sand. About 30 metres past the cave there is a low overhang and further on a larger one that can be entered. You can swim out the back. This is as far as you are likely get, so return back to the anchor. An alternative from The Tunnel is to follow the (indistinct) split behind the main wall to the north. Look under the many small overhangs along the way for other fish. When you get back to the anchor area, you will almost certainly have a large number of blue gropers, combfish, eastern king wrasse, crimson-banded wrasse and maori wrasse following. The fish are so friendly that they will swim right up and look you in the eye and you can stroke and touch them as much as you want. Because the maximum depth here is 28 metres (you will probably only reach 27), with an average of 24 metres, it means that you can only safely spend about 25 minutes examining the site. You need to dive here at least ten times to really see and appreciate the beauty of the whole site. As well as these attractions, there is the nearby Split which is really just a northern extension of Barrens Hut. 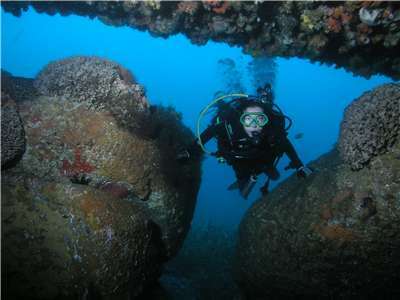 This is truely a great dive site, well worth doing over and over again. Video partly shot at Barrens Hut on 6 July 2011.